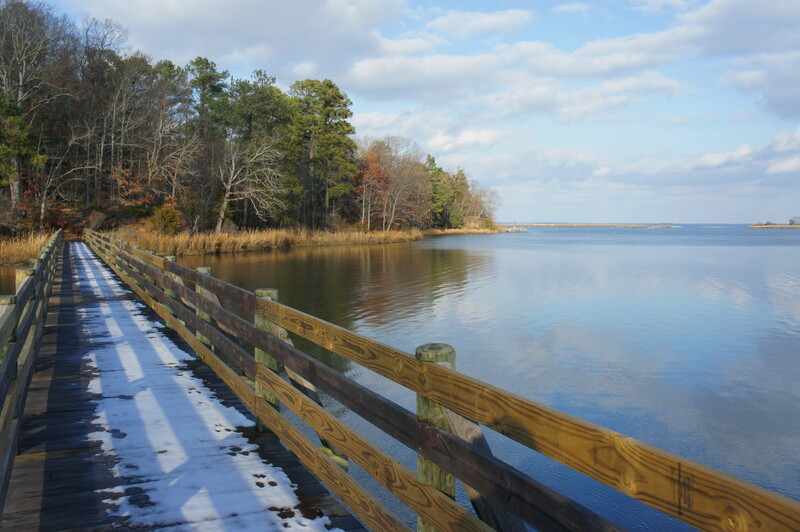 The roughly one-mile Nature Trail at Virginia’s George Washington Birthplace National Monument offers a short journey through peaceful woodlands situated across Dancing Marsh from the main historic area. 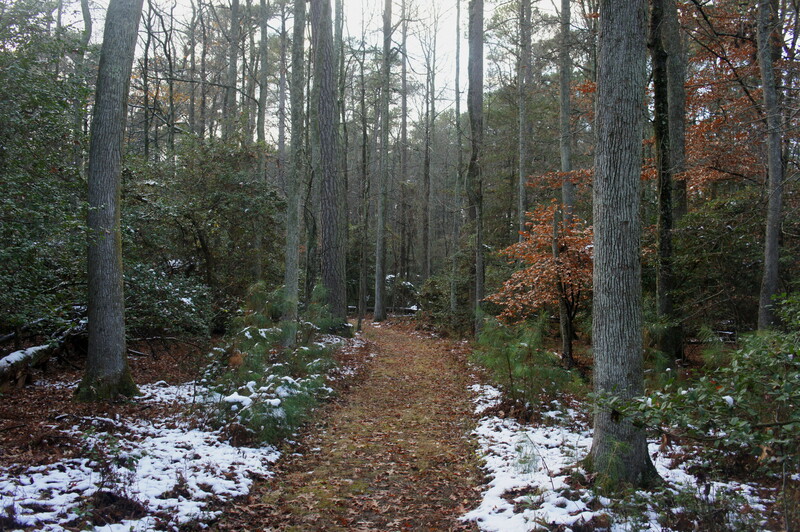 The forest was the old stomping grounds of George Washington, who, despite moving area from the Pope’s Creek area when he was only three, often returned to visit the plantation during his childhood. 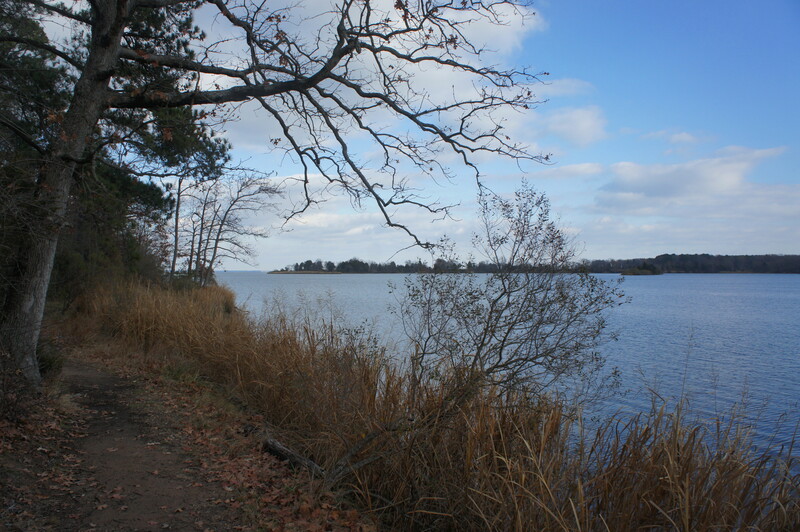 Washington serves as the narrator for the hike, with interpretive signs along the trail describing the future U.S. President’s childhood views of the farmstead on the Potomac River. 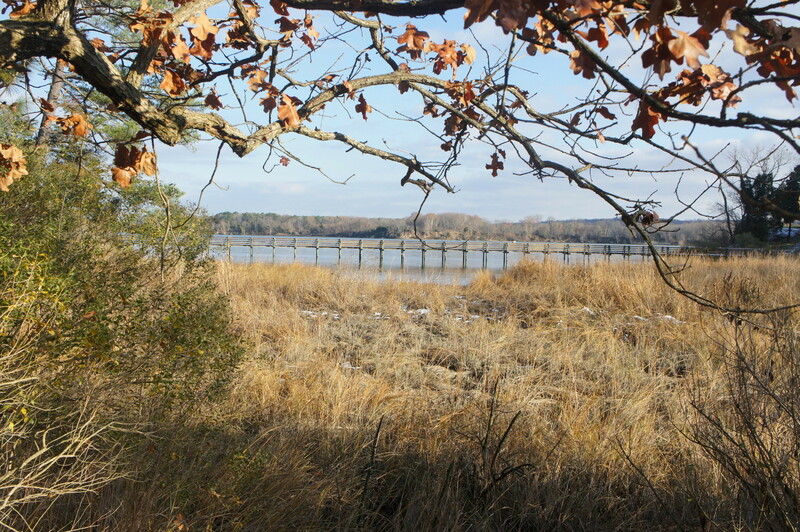 There are three principal ways to access the Nature Trail: first, parking at the picnic area at Duck Hall Point; second, connecting with the ¾-mile Dancing Marsh Trail; or third, crossing a lengthy footbridge from the historic area. This route description covers the third option, as the Nature Trail makes for a good complement to a tour of the Memorial House and farmstead. From the Memorial House, head north on the graveled path leading down to the banks of Pope’s Creek, where you will find the lengthy wooden footbridge and the start of your hike. 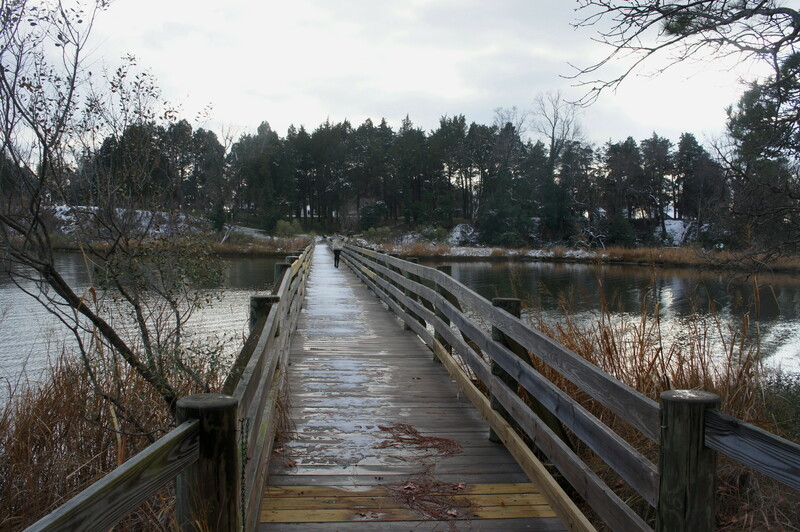 Traverse the bridge over a tidal marsh, then bear right at the trail fork as the Nature Trail splits. This is the start of the loop portion of the hike. For the next 100 yards, the Nature Trail hugs the edge of Pope’s Creek, approaching a spur trail to the Log House—a former gift shop, restaurant, and inn built in 1932. Stay right at this fork—as well as a second junction at about 2/10 mile. By now the trail has climbed roughly 10-20 feet in elevation, flattening out as the path emerges from the woods and crosses a grassy field at the picnic area. Head west and cross the paved road, looking for the continuation of the trail as it darts back into the woods. By now the path is wide and grassy and bears west through a forest dotted with holly, hemlock, and sweet gum trees. Occasional interpretative panels paint a picture of life on the Pope’s Creek Plantation in the 18th century, when George Washington and his relatives roamed the area. Never quite leaving earshot of the road, the trail crosses the pavement at about 7/10 mile, then bears south and descends gradually to Dancing Marsh. Bear left at the junction with the Dancing Marsh Trail, bearing east on the Nature Trail as it heads back toward the footbridge. Steps later, the path passes under a set of powerlines. Soon the footbridge comes back to view, with Pope’s Creek beyond. The loop section ends at around the 1-mile mark; bear right and cross the bridge, returning to the historic area and bringing the short hike to a close. Allot between 30 minutes to an hour for this easy hike. 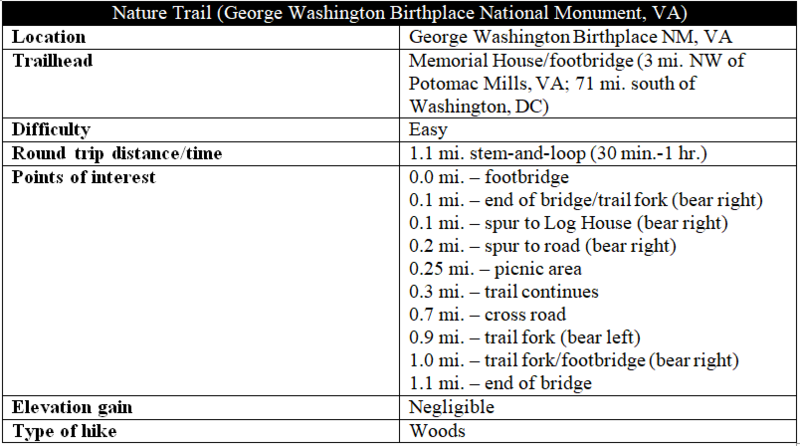 This entry was posted in Easy Hikes, Revolutionary War, Virginia and tagged Dancing Marsh, George Washington, George Washington Birthplace National Monument, historic, loop hike, Nature Trail, Pope's Creek, Potomac River, Virginia. Bookmark the permalink. Andrew Wojtanik,thank you for this post. Its very inspiring.